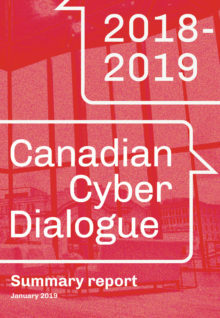 The first annual Canadian Cyber Dialogue convened in Ottawa in November 2018, bringing together 71 participants from government, the private sector, civil society, and the Munk School’s Citizen Lab to discuss pressing cybersecurity issues facing this country. Under Chatham House rules, the forum addressed preparedness; private sector- government coordination; cybersecurity foreign policy; and disinformation, fake news, and violent extremism. Possible topics and format for the next Cyber Dialogue and mid-year working groups were also discussed. This summary report outlines discussion themes and highlights.